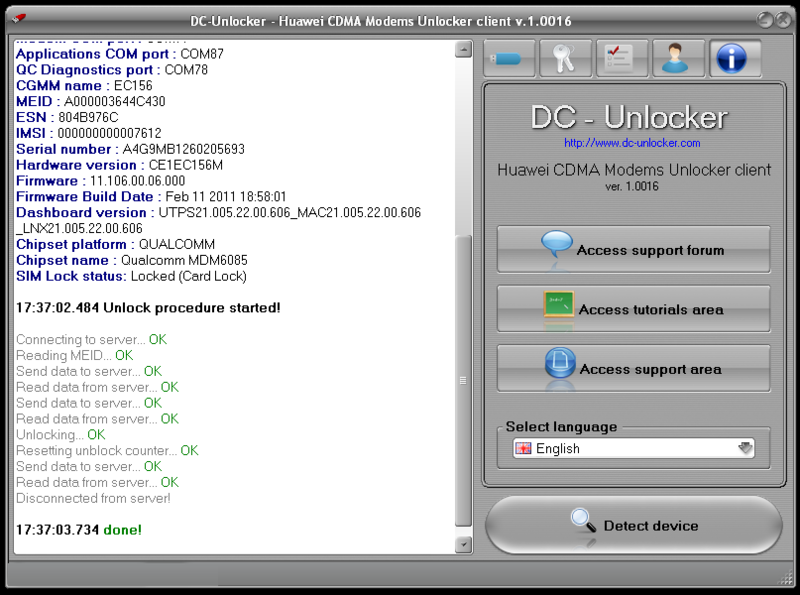 В свежей версии ПО DC-Unlocker Huawei CDMA Modems Unlocker client 1.0032. Добавлена возможность разблокировки для модемов Huawei EC156 и Huawei EC152. Последний раз редактировалось Despedo; 17.10.2014 в 11:41. Usefull if phone not had bootloader code, but was upgraded to locked bootloader firmware. -Improved automatic wrong code counter reset. Time limited offer - FREE DC unlocker credits. More information on DC-Unlocker facebook page. Free unlock and code generation, all v1, v2, v3 Huawei algos for dongle users. Also available direct unlock for Pantech, contact us if you have phone with blocked counter. NOTE: Dongles that were purchased in 2011 and before has their support ended. In order to use latest software versions need to purchase dongle support for 1 or 2 years. Without purchasing dongle support, new software releases and new unlimited services for dongle users won't work. Direct Unlock, no root, no adb, no bootloader code required.